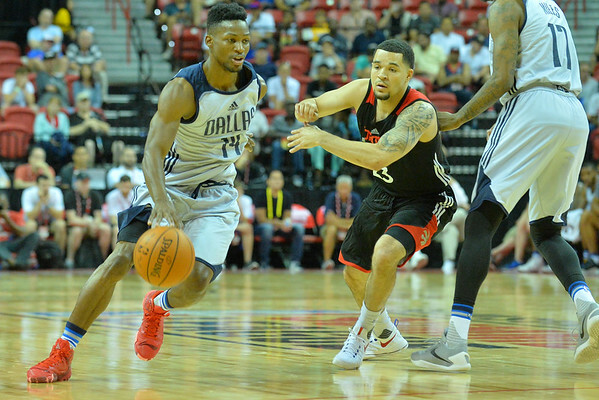 July 11, 2016; Las Vegas, Nev.; Dallas Mavericks guard Jonathan Gibson (14) dribbles past Toronto Raptors guard Fred VanVleet (23) in a 2016 NBA Summer League game between the Toronto Raptors and Dallas Mavericks at Thomas and Mack Arena in Las Vegas, Nev. 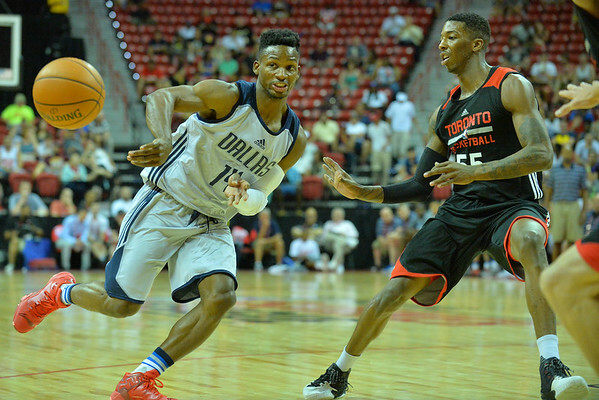 The Raptors defeated the Mavs 80-69. 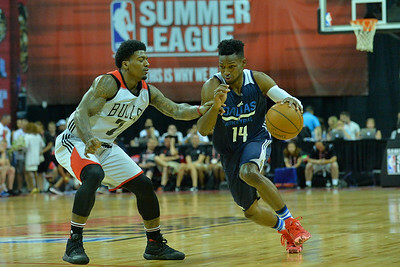 July 11, 2016; Las Vegas, Nev.; Dallas Mavericks guard Jonathan Gibson (14) passes off the dribble in a 2016 NBA Summer League game between the Toronto Raptors and Dallas Mavericks at Thomas and Mack Arena in Las Vegas, Nev. The Raptors defeated the Mavs 80-69. 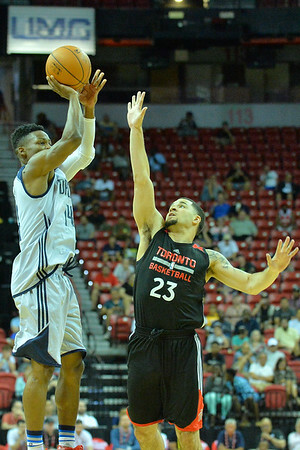 July 11, 2016; Las Vegas, Nev.; Dallas Mavericks guard Jonathan Gibson (14) shoots over Toronto Raptors guard Fred VanVleet (23) in a 2016 NBA Summer League game between the Toronto Raptors and Dallas Mavericks at Thomas and Mack Arena in Las Vegas, Nev. The Raptors defeated the Mavs 80-69. 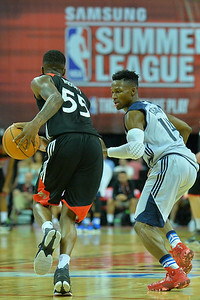 July 11, 2016; Las Vegas, Nev.; Dallas Mavericks guard Jonathan Gibson (14) drives past Toronto Raptors guard Delon Wright (55) in a 2016 NBA Summer League game between the Toronto Raptors and Dallas Mavericks at Thomas and Mack Arena in Las Vegas, Nev. 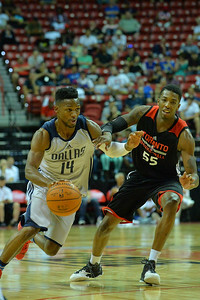 The Raptors defeated the Mavs 80-69. 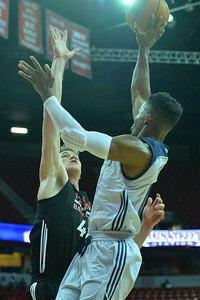 July 11, 2016; Las Vegas, Nev.; Dallas Mavericks guard Jonathan Gibson (14) drives to the basket in a 2016 NBA Summer League game between the Toronto Raptors and Dallas Mavericks at Thomas and Mack Arena in Las Vegas, Nev. 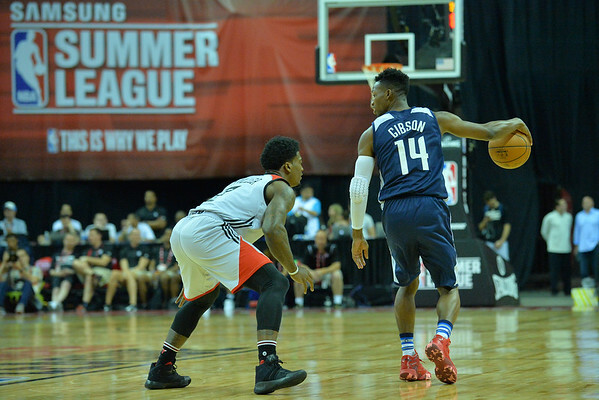 The Raptors defeated the Mavs 80-69. 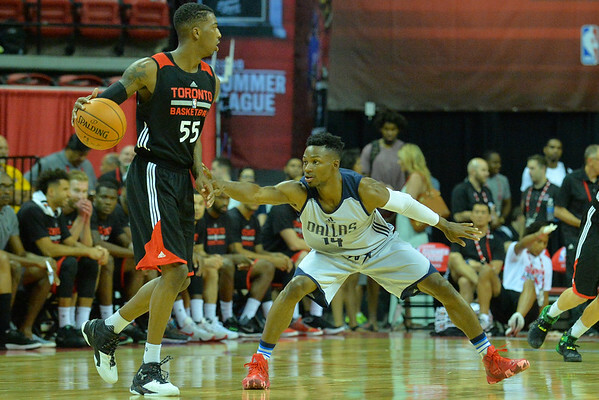 July 11, 2016; Las Vegas, Nev.; Dallas Mavericks guard Jonathan Gibson (14) guards Toronto Raptors guard Delon Wright (55) in a 2016 NBA Summer League game between the Toronto Raptors and Dallas Mavericks at Thomas and Mack Arena in Las Vegas, Nev. 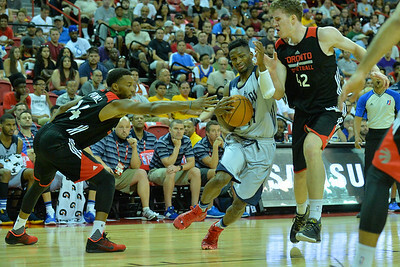 The Raptors defeated the Mavs 80-69. 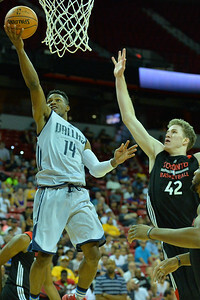 July 11, 2016; Las Vegas, Nev.; Dallas Mavericks guard Jonathan Gibson (14) gets a layup in a 2016 NBA Summer League game between the Toronto Raptors and Dallas Mavericks at Thomas and Mack Arena in Las Vegas, Nev. 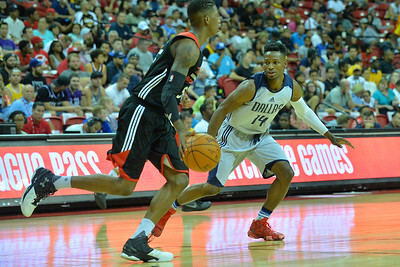 The Raptors defeated the Mavs 80-69. 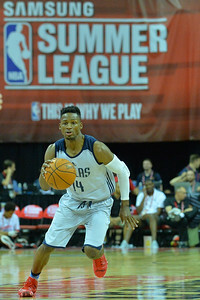 July 11, 2016; Las Vegas, Nev.; Dallas Mavericks guard Jonathan Gibson (14) brings the ball up the court in a 2016 NBA Summer League game between the Toronto Raptors and Dallas Mavericks at Thomas and Mack Arena in Las Vegas, Nev. 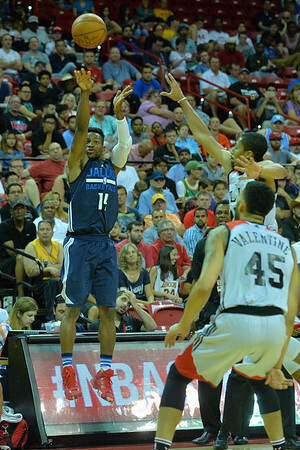 The Raptors defeated the Mavs 80-69. 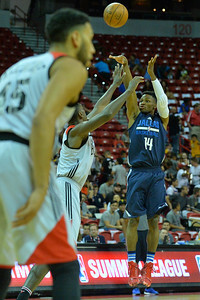 July 11, 2016; Las Vegas, Nev.; Dallas Mavericks guard Jonathan Gibson (14) shoots a three pointer in a 2016 NBA Summer League game between the Toronto Raptors and Dallas Mavericks at Thomas and Mack Arena in Las Vegas, Nev. 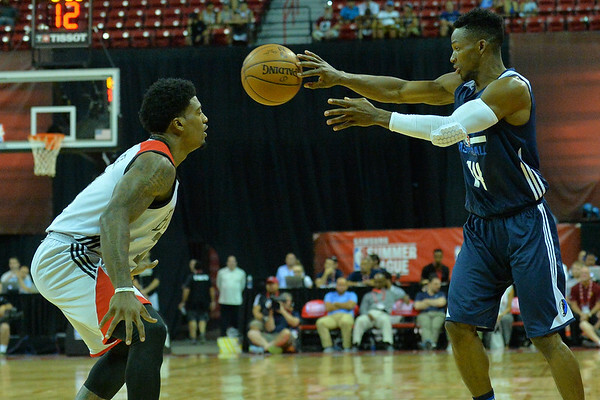 The Raptors defeated the Mavs 80-69. 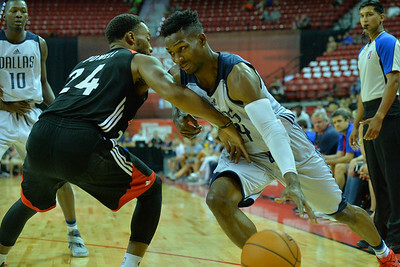 July 11, 2016; Las Vegas, Nev.; Dallas Mavericks guard Jonathan Gibson (14) drives the baseline against Toronto Raptors guard Norman Powell (24) in a 2016 NBA Summer League game between the Toronto Raptors and Dallas Mavericks at Thomas and Mack Arena in Las Vegas, Nev. 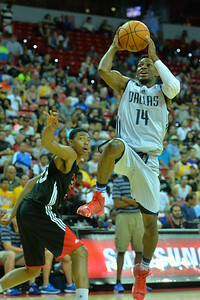 The Raptors defeated the Mavs 80-69. 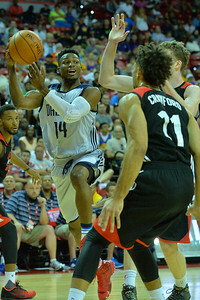 July 11, 2016; Las Vegas, Nev.; Dallas Mavericks guard Jonathan Gibson (14) drives past Toronto Raptors guard Norman Powell (24) and Toronto Raptors center Jakob Poetl (42) in a 2016 NBA Summer League game between the Toronto Raptors and Dallas Mavericks at Thomas and Mack Arena in Las Vegas, Nev. 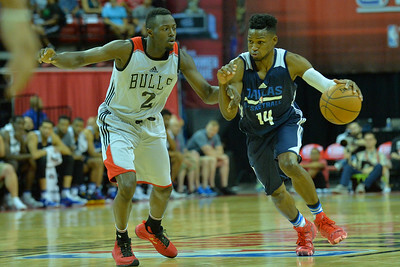 The Raptors defeated the Mavs 80-69. 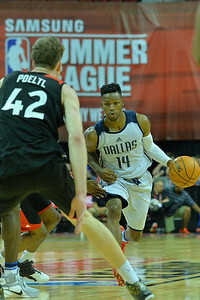 July 11, 2016; Las Vegas, Nev.; Dallas Mavericks guard Jonathan Gibson (14) looks to pass in a 2016 NBA Summer League game between the Toronto Raptors and Dallas Mavericks at Thomas and Mack Arena in Las Vegas, Nev. The Raptors defeated the Mavs 80-69. 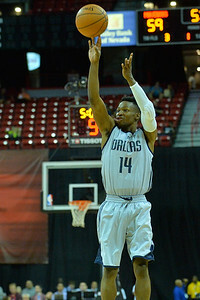 July 14, 2016; Las Vegas, Nev.; Dallas Mavericks guard Jonathan Gibson (14) shoots a three pointer in a second round game of the 2016 NBA Summer League between the Dallas Mavericks and Chicago Bulls at Thomas and Mack Center in Las Vegas, Nev.
July 11, 2016; Las Vegas, Nev.; Dallas Mavericks guard Jonathan Gibson (14) puts up a floater over Toronto Raptors center Jakob Poetl (42) in a 2016 NBA Summer League game between the Toronto Raptors and Dallas Mavericks at Thomas and Mack Arena in Las Vegas, Nev. 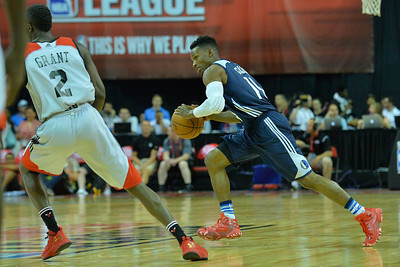 The Raptors defeated the Mavs 80-69. 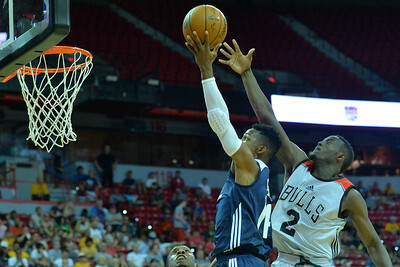 July 14, 2016; Las Vegas, Nev.; Dallas Mavericks guard Jonathan Gibson (14) dribbles pas Chicago Bulls guard Jerian Grant (2) in a second round game of the 2016 NBA Summer League between the Dallas Mavericks and Chicago Bulls at Thomas and Mack Center in Las Vegas, Nev.
July 14, 2016; Las Vegas, Nev.; Dallas Mavericks guard Jonathan Gibson (14) passes to a teammate in a second round game of the 2016 NBA Summer League between the Dallas Mavericks and Chicago Bulls at Thomas and Mack Center in Las Vegas, Nev.
July 14, 2016; Las Vegas, Nev.; Dallas Mavericks guard Jonathan Gibson (14) dribbles around a defender in a second round game of the 2016 NBA Summer League between the Dallas Mavericks and Chicago Bulls at Thomas and Mack Center in Las Vegas, Nev.
July 14, 2016; Las Vegas, Nev.; Dallas Mavericks guard Jonathan Gibson (14) drives past Chicago Bulls guard Patrick Miller (7) in a second round game of the 2016 NBA Summer League between the Dallas Mavericks and Chicago Bulls at Thomas and Mack Center in Las Vegas, Nev.
July 14, 2016; Las Vegas, Nev.; Dallas Mavericks guard Jonathan Gibson (14) drives past Chicago Bulls guard Jerian Grant (2) in a second round game of the 2016 NBA Summer League between the Dallas Mavericks and Chicago Bulls at Thomas and Mack Center in Las Vegas, Nev.
July 14, 2016; Las Vegas, Nev.; Dallas Mavericks guard Jonathan Gibson (14) drives past Chicago Bulls guard Jerian Grant (2) for a layup in a second round game of the 2016 NBA Summer League between the Dallas Mavericks and Chicago Bulls at Thomas and Mack Center in Las Vegas, Nev.